This 2015 Upgraded End Unit is located literally 50 steps from the Warm Sand between your toes on our Pristine Never Crowded Beach! This unit is very popular due to its proximity to the Beach and our Crystal Clear Pool (See Overhead Satellite Picture for unit location). This Clean Cozy Condo offers many upgrades including beautiful Bead Board Paneling, Crown Molding, and Upgraded Floors. Enjoy Breathtaking Ocean and Sunset Views from our wraparound shared balcony, or from either of our Gazebo Beach Entranceways. We have an 8 foot deep adult pool and a fenced in 1.5 foot deep kiddie pool. Restaurants and Molly's Beach Bar, are a short walk away. Take advantage of our full kitchenette, or BBQ on one our outdoor charcoal grills and enjoy open air dining. Perfect getaway for a romantic weekend, or a family retreat ... watch dolphins splash from the oceanside gazebo ... don’t miss the sunset disappear beneath the ocean waves .... stroll the sandy beach ... build a sandcastle with the kids ... surf cast or fish from our beach ... watch surfers hang ten.... or just relax by the pool. - This is a SMOKE FREE COMMUNITY. (You may not smoke on the property to include balconies and gazebo's). - Pets and Animals (Including Emotional Support and Service Animals) are not allowed per Homeowners Rules. - Max 4 guests including infants. (Max 3 adults recommended). - No boats or trailers allowed to park on the premises. - Facilities only for registered guests to include beach access, pool, and parking area. Built in 2015, Ocean Sands Getaways is one of the Newest Oceanside communities in Atlantic Beach, NC. the unit is located on the first floor and because of its convenient location you can actually drive right up to the front door to drop off your belongings. The beach is just around the corner and the pool is nearby. This property is a hidden gem that many people just don't know about! The truth is that many owners want to keep this piece of private beach a secret, but I want to share it with you! The setting is amazing. Enjoy our charcoal grills, and have dinner with your family on our brand new picnic tables. You can enjoy the sunny outdoors, while listening to the sound of waves breaking on the shore, and the aromatic aroma of sea salt in the air! You just can't beat rolling out of bed, and in a few steps planting your feet into the warm, soft Atlantic Beach sand! Staying on the beach is the way to go! There is no need to worry about crossing busy roads, or paying for parking, etc.. And for those of you with kids, well there are many activities for them as well. There is a large green lawn area, so if they get tired of playing on the beach, they can kick the soccer ball, play horseshoes, or whatever activity sparks their interest. And there is even a small wading pool that is fenced in to keep those smaller children from wandering off. And the new Atlantic Beach Park is within walking distance. So regardless if you are vacationing for a week, or getting away for the weekend, come stay at our place, and please make it your own! I know you are going to have a fantastic time! You are staying about 50 yards from the warm sand between your toes and the fresh smell of the Ocean in the air. Panoramic Beach Views from our Gazebo's and from our Shared Balcony Seating on the 2nd story on the Oceanside of the Building. Not from inside this unit. Panoramic Ocean and Sunset Views from our Gazebo's and from our Shared Balcony Seating on the 2nd story on the Oceanside of the Building. Not from inside this unit. This resort is Oceanfront. See overhead satellite pics for unit location inside the resort. Panoramic Water Views from our Gazebo's and from our Shared Balcony Seating on the 2nd story on the Oceanside of the Building. Not from inside this unit. 2 sets of sheets available for guest use. 4 bath towels/wash cloths and 1 hand towel are provided. 4 sets of Plates, Glasses, etc. Cafe style table for 2 adults. Children can eat using the coffee table. Island Beach and Racquet Club is just across the street. 8 foot deep Pool and also a separate fenced in kiddie pool for the little ones to securely play! Fantastic Location! Plus you have a fully equipped kitchen at your disposal. Unit is professionally cleaned prior to your arrival. There is no Daily Maid service. This is a No-Smoking Community. Smoking not allowed on the premises. Guests must agree to read and adhere to Condo Association Rules as you will be our personal guest. Failure to follow rules could result in loss of damage deposit, additional fines and potential eviction. Thank you for your Review and letting us know you had a Wonderful Time. At first glance, It appears that you may have intended to write this review as private feedback, but may have accidentally made the private feedback into your review instead. No problem as it gives us a great talking point to address to our future guests regarding how we operate our Vacation Rental in this growing and expanding market. While we cannot offer some amenities hotels may offer such as daily maid service, we do offer two features many hotels cannot. 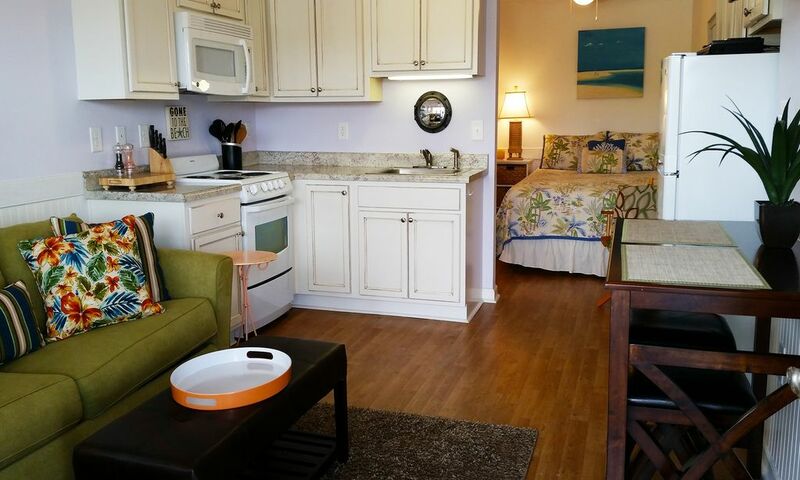 We are right next to the beach, and we have a kitchen. Narrative: Barbara had booked a 5 night stay. Late on the 4th night she had contacted me requesting more towels and TP. Note: Our rooms are set for an average 3 night stay per website information. We provide 4 towels per room. Barbara's group had two people. Our Vacation Rental includes linens and towels, which was not the standard years ago when this industry formed. I do however offer a towel swap and a refresh of TP for guests staying 4 nights or longer. I explained to Barbara that the additional two towels were located in the cabinets. Unfortunately because we were not contacted until just before the end of Barbara's stay, and our cleaners were not already scheduled to be on site the next day, we could not provide the requested item. Had we been contacted earlier we could have planned accordingly and Barbara would have had a refresh of the requested items that same day. Since there is a Dollar General just across the street Barbara mentioned she would pick up her requested item. I offered to refund Barbara despite the fact the information was already included on the website and in our Check-In Documents, which were made available well prior to the beginning of the guests stay. Thanks again for letting us know, so we can use this information to improve and align ourselves more with Vacationer's desires and needs as the Vacation Rental Industry continues to grow and expand. Really had a great time. The interior is really nice and new. It felt very clean. You can park right in front of the place so it was super easy and the beach is just steps away. We had an evening drink and watched the pretty sunset from the gazebo. Easy walk to great restaurants and Molly's. I'd recommend to others. Cute Condo right next to the Beach! Thank you for the Awesome Review! Look forward to having you back to the Crystal Coast! We were disappointed as soon as we walked in to the room. It is very small and would have been impossible space wise for more than 2 people. There is zero closet space! We had brought clothes for goin out but had to leave them hung up in our car because there wasn’t anywhere in the room to hang them up. The floor board air ran constantly which caused the room to be very humid in the room. Drying a pool towel in the room was impossible (rules stated you couldn’t hang towels outside). This place needs a designated smoking area going out to the main road or walking all the way to the beach just to smoke is ridiculous and at night not safe. Stay on Atlantic Beach! Stay a night or two, a week, or a month! Some Attractions this year: 4th of July fireworks, MCAS Cherry Point Airshow w/ the Blue Angels, Beaufort Music Festival, Big Rock Blue Marlin Tournament, NC Seafood Festival, Summer by the Sea, Pine Knoll Shores Aquarium, Salter Path Clam and Scallop Fest, 6th Annual Flounder Surf Fishing Tournament, Buddy Pelletier Longboard Contest , Beaufort Blackbeard Pirate Festival, Ducks Unlimited 'Band The Billfish', Pirate Week at the N.C. Maritime Museum , Carolina Chocolate Festival, Crystal Coast Civic Center functions, Emerald Isle St. Patrick's Day Festival, Carolina Kite Fest, 11th Annual Antique-A-Thon , Fort Macon Civil War Reenactment, Annual Wooden Boat Show. Or you could just lounge at the beach/pool, fish, surf, play horseshoes, or enjoy the breathtaking sunrises / sunsets. Tennis courts & Golf courses nearby. Bike rentals w/ free delivery are available.